UAE stay at top with convincing win over Bahrain. Batting first UAE posted the decent total of 149 runs on board. On other hand, Bahrain had done tremendous job to pulled off 9 wickets against very strong side. Muhammad Usman lead UAE’s inning with exceptional inning. He slammed 52 runs taking 33 balls with 4 sixes and 2 fours. Ashfaq Ahmed (29) and Rohan Mustafa (22) were other notable contributor for UAE with a bat in hand. For Bahrain, Sikder Billah got 4 scalps of UAE where Mohamed Noor and Zeeshan Abbas picked 2 wickets each. Chasing the target of 150 runs against strong UAE, Bahrain looked promising at half stage with only losing 2 wickets for 53 runs but they couldn’t left any impact in the match. They only managed to score 98 runs losing 8 wickets in stipulated 20 overs, to register 51 runs defeat against UAE. Yasser Nazir topped their scorecard with 26 runs. Kurup and Badar were other notable contributor for Bahrain with 21 and 17 runs respectively. Qadeer Ahmed picked up 4 wickets for UAE. With this, every teams played 3 matches each. Top 3 sides of the competition will proceed themselves to main draw of Asia’s qualifier for ICC World T20 Qualifier 2019. 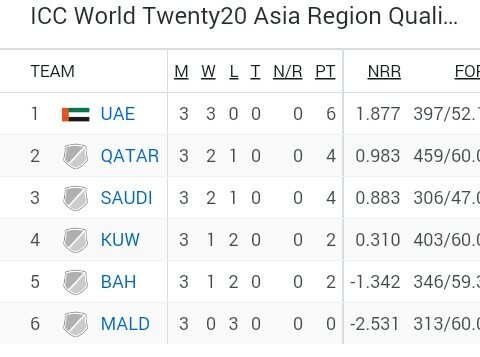 UAE is ruling the point table with 3 victories. Their neighbouring nation, Qatar is placed on second position with 2 victories, Saudi is just bit behind Qatar with less net run rate. Kuwait and Bahrain has a win under their belt where Maldives is still searching for their first win.